… their wedding took place on September 27, 2014, in Venice. Italy. Me Alamuddin (Clooney)’s exquisite custom-made, French lace Oscar de la Renta dress was embroidered with pearls and diamanté accents and featured a gorgeous lace overlay and off-the-shoulder sleeves. The groom, meanwhile looked very smart in a black tuxedo, which was created by Giorgio Armani. 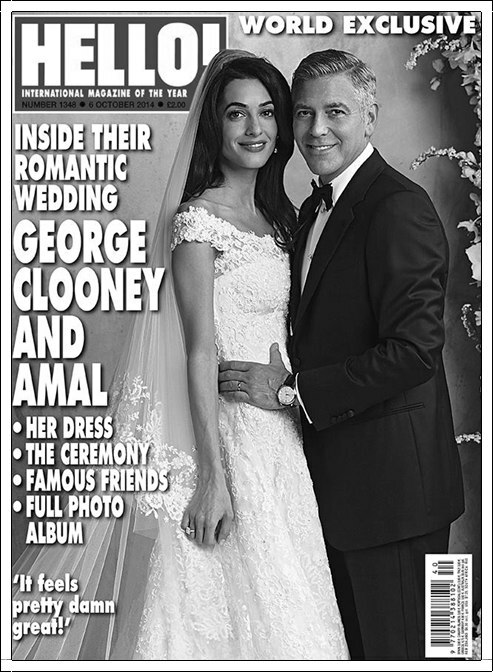 It was teamed with a white shirt, black bow tie and black leather oxfords and the finishing touches were cufflinks gifted from Amal, with "George" inscribed in Arabic.